Happy Wednesday! 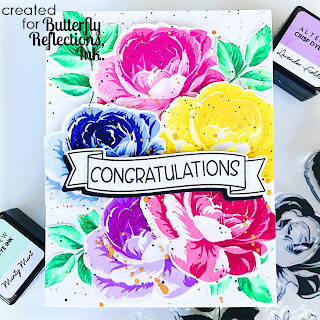 Lindsay here on the Butterfly Reflections, Ink blog today with a card using Altenew and Avery Elle products. A while back I got this Altenew Build-A-Flower Stamp and Die Set from Butterfly Reflections, Ink when it was sold out everywhere else. I totally fell in love with this flower the second I saw it. I mean, I love all of the flowers in the Altenew Build-A-Flower line, but this one really spoke to me, and I was so excited to be able to get it from Vanessa's shop! For this card I started by stamping the layering images out using all Altenew Mini Ink Cube Sets. 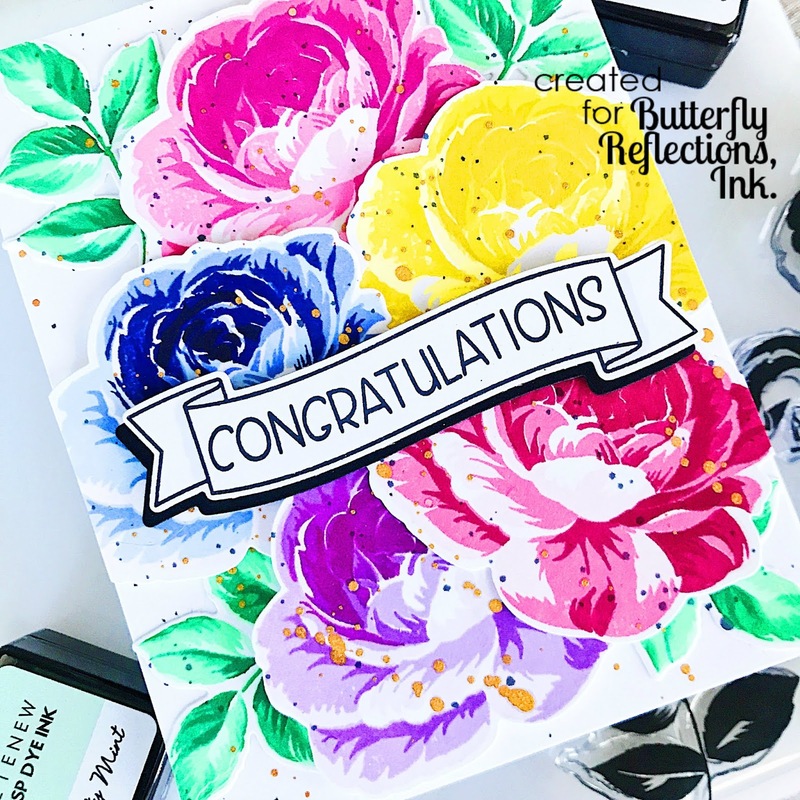 I love that Altenew has these ink sets, that way you know you'll get a gorgeous look with any stamp layering set. (Just a note, the Build-A-Flower Rose comes with 6 layers. I've only used 4 for these images as that's how many ink cubes I had to work with. However, you can stamp the same ink color multiple times using a MISTI and you can get enough color difference using 4 ink cubes to be able to stamp all 6 layers). I actually like the rose with just the 4 layers so I stuck with that. After stamping all of the images, I then went to my die cutting machine and cut out all of the flowers and leaves. I arranged my colorful rainbow of flowers onto a card front and decided I wanted some splatter. Using Black Soot Distress Oxide Ink and Gold Gansai Tambi Watercolors I splattered the whole front of the card once it was all adhered using Foam Tape. I then decided I needed a bold greeting to stand out against the busy background. I decided to use the Avery Elle Banner Bits stamp and Die Set for my sentiment. I layered a black Banner Die Cut behind the sentiment banner to make it pop even more. Thanks for stopping by today! 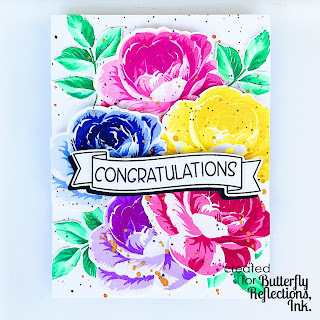 I hope that you have enjoyed my card and that I've inspired you to try some stamp layering techniques! Have a great rest of your week! My favorite Altenew build-a-flower set of all time. Your card is fabulous.